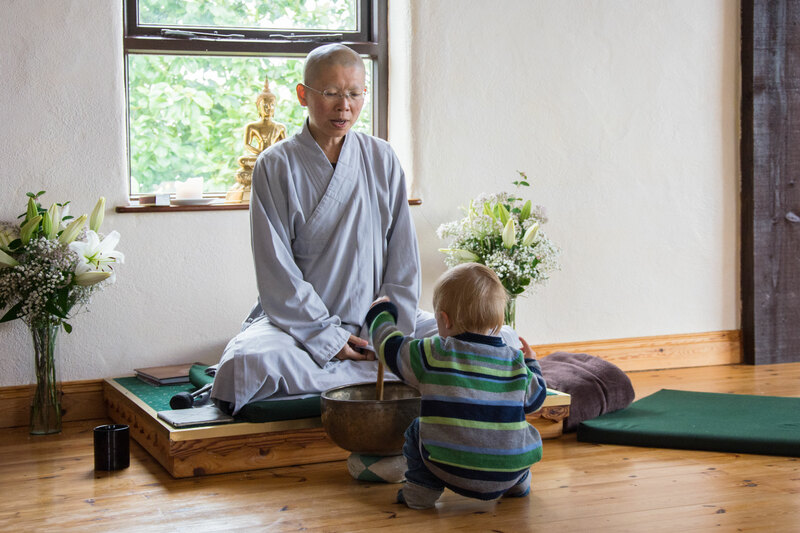 Our fourth family camp will take place at Sunyata Buddhist Centre from July 3rd to the 7th. The camp aims to create a supportive environment for parents to practice Dharma and apply mindfulness methods in every day family life. The camp will be an opportunity for families to support and learn from each other, to explore how to apply the teachings of the Buddha in family life. It is also a chance to rest and enjoy spending time with the members of your family without the complications of the world. Families will be given the space to relax and enjoy some time away from their busy worlds in a beautiful setting. There will be lots of opportunities for parents to practice on their own, organised nature exploration and art activities for children of different age groups, as well as shared daily practices. Families of all ages, sizes and kinds are welcome! Camping facilities and dorm space available. Registration for this retreat will be from 2pm on Wednesday 3rd with a light meal served at 5.30 followed by an orientation talk at 7pm. The retreat will end at approx 1pm on Sunday the 7th. This retreat will be an opportunity to experience the space to spend time with your family in a mindful way and to reflect on your practice in a supportive community environment . A period of retreat time can shed a wide light on our lives and can allow fresh perspectives to emerge. It allows us to become more established in our practice. The Thai Forest Master Ajahn Chah described meditation as a “holiday for the heart” and that is an apt description of the retreat experience. Retreats afford one an opportunity to deepen their understanding of what the Buddha called” Dharma” or the nature of experience. What kind of practices will you be engaged in? This camp will be quite different to a typical meditation retreat and will involve periods where parents and children will be engaged in varying forms of practice together and separately. A typical day will involve shared morning Dhamma contemplation. This will be followed by a daily program for children of all ages (with different programs for each age group) that will include nature based exploration and awareness activities, games for investigating awareness, dhamma sharing practices and the opportunity for play, art and creativity. These practices will be lead by the camp team and parents will have plenty of time to join in with their own activities and/or spend time in quiet reflection. The retreat will also include a daily chore period. See below for typical schedule. Who can come on the retreat? Families of all sizes are welcome on this retreat. We are a small centre, however, every effort will be made to give families a comfortable and spacious environment to practice and stay in. There will be roughly 20-25 people staying on site including both adults and children. There is no restriction on children’s age, however please do book early so that we can anticipate the needs of different age groups. In general, retreats are open to anyone with a genuine interest in peace of mind. Although Sunyata is a Buddhist centre, one does not have to consider oneself a Buddhist in order to attend. Most people are drawn here because of their interest in practice or simply a desire to understand life and live more peacefully. People of all ages, backgrounds, and spiritual paths attend retreats at Sunyata. There will be two main meals during the day, a dinner and a light meal in the evening plus Breakfast. All meals will be provided by the Centre. We serve nutritious vegetarian (but not vegan) meals. Special diets can be accommodated upon request, although we do encourage participants with special dietary requirements to bring some supplies of their own to supplement the meals on offer. For example we usually don’t provide gluten-free bread on retreats so we ask participants to bring their own. Please note: Both dorm and camping spaces are limited so if you have a strong preference please book early. You will need to bring the following: bedding, to include sheets, pillowcase,pillow and duvet sleeping bag. We do not supply bedding at the Centre unless you are travelling from overseas. You will also need to bring a towel, toiletries, loose / warm / comfortable clothing, outdoor shoes / wellingtons and coat for walking outdoors, slippers or thick socks for indoor wear. You may also want to bring personal items such as ear plugs, hot water bottle, and an umbrella or other rain gear. A fleece/shawl to wear during meditation may also come in handy. Important: Please do not bring audio or computer devices such as MP3 players, tablets, ipads or CD players. We are hoping to create an environment where families can engage in peaceful and shared practice and take a break from everyday distractions. You’re Ipad will still be there when you get back! Retreatants are asked to switch off mobile phones for the duration of the retreat. This means that anyone who wished to attend a retreat at Sunyata may do so regardless of their financial circumstances. We are asked sometimes for guidance regarding donations and we calculate that €35 per Adult per and €20 per Child per day will meet the running costs of the centre for this retreat. However this is a guide only and if one cannot afford this amount then there is no obligation to do so. Equally, if one wishes to give more than the guided amount, then one is welcome to do so. All donations are anonymous. Nobody involved in the running of the retreat receives any payment and all funds will go directly to the upkeep of the centre. Please note: This schedule is a rough guide only and is subject to change. 10.00am Daily program for children of all ages (with different programs for each age group) that will include nature based exploration and awareness activities, games for investigating awareness and Buddhist principles and fun activities* Parents will have the option to practice on their own or take part in group adult activities.